Blockchain Technology Is Making An Indelible Impact Worldwide The proliferation of Blockchain technology promises open, transparent and distributed platforms for industries such as Insurance, Healthcare, Real Estate, Manufacturing, Supply Chain, Banking and Finance. Blockchain Technology Is Making An Indelible Impact Worldwide The proliferation of Blockchain technology promises open, transparent and distributed platforms for industries such as Insurance, Healthcare, Real Estate, Manufacturing, Supply Chain, Banking and Finance. The Blockchain excels in managing cumbersome operations in a safe and simplified manner for e.g., managing funded projects of the NGOs and the government, supply chain management processes and HR recruitment processes. A global level transformation in terms of blockchain technology implementation is a matter of time as the number of the blockchain use cases rise by the day, which in turn, improves the transparency and accountability. Today, a large number of companies are engaged in harnessing the potential of Blockchain. However, only a few companies can deliver tailored solutions directly addressing their clients’ needs, while maintaining high quality and performing consistently. One such company is ‘Agira Technologies’. Agira’s main office is located in Chennai, India, and it has an office at New Jersey, USA also. The company offers seamless technology solutions to clients with assurances of high quality service and complete satisfaction. Also, the company is passionate about helping entrepreneurs, medium sized organizations, agencies and startups, fulfill their ambitions. Under the leadership of Ganapathi M, the founder and CEO, the company is now one of the fastest developing Blockchain Technology services providers in the Asia-Pacific region. Agira Technologies has expertise in building public and private Blockchain Applications, DAPPS (Decentralized Application) and Crypto Currency Applications. Agira has the capability do consulting and application development on blockchain platforms like Ethereum, Hyperledger and AWS – QLDB. These skills include development of smart contract, wallets, integrating with legacy and enterprise applications also. Agira has built white label solution and products like Crypto Exchanges, Payment Gateways and Trading Bots. Ganapathi M. says, “Our Blockchain enthusiasts will brilliantly shape your ideas into exquisite Blockchain apps and wallets for the web, mobile and desktops”. Ganapathi M. adds, “Agira Technologies has developed a number of proof- of-concepts, products and prototypes. We cater the skills to develop different application segments as in web &amp; mobile (Android &amp; iOS) front-ends, APIs and Databases/Blockchain components. A few of the use cases we built in the past are ecommerce payment gateways, application to track organ transplantation volunteers, digital identity management, initial coin offerings and employment background check. A Holistic Engagement Model Ensuring Satisfied Cientele Agira Technologies indulges clients in an inclusive, educative and conversational manner. They engage clients through activities such as discussions, Blockchain Application demonstrations, helping clients grasp a clearer understanding of the technology, conducting workshops and finally integrating the technology into the clients’ system. Agira’s strong commitment, diverse clientele, unique team, tailored solutions, up-to-date technology and agile practices are the main reasons why new clients want to avail the company’s services for their Blockchain development requirements. Ganapathi M. says, “Our customer-centric approach helps us in holding a big share of the market consistently and lets our clients come back to us frequently. Our clients are our first priority; we aim to put a smile on their faces. We empathize with their situation and service them with the best solution available in the market.” It is through its unique ability to visualize from the client’s point of view and contemplate over their ideas to arrive at the best solutions that Agira is able to maintain excellence in its services. With over three years in the market, having served more than 50 clients and having aided in more than 150 implementations, the ever-ready Agira Technologies continues to gain a greater reputation in the market and gain more contacts. To add up, Ganapathi M. says, “We understand the life of high ambitions, scarce resources, limited time and an unparalleled excitement”. Ganapathi M. says, “The Blockchain is a beautiful platform. We, at Agira Technologies, are training ourselves to be well-versed and proficient in all it’s aspects. Additionally, we want to inculcate entrepreneurial qualities in everyone we bring onboard”. Its immediate mission is to gain a clearer and actionable understanding of the areas where the Blockchain will be a game changer. Ganapathi M. informs, “In the near future, we will be open to collaborate with other companies to arrive at superior solutions, and we will be actively searching for investors and institutions to help us reach greater heights. We want to make a technical impact in the global Blockchain environment”. Agira Technologies maintains an excellent command over so many aspects of technology especially the Blockchain. The company firmly believes in the Blockchain’s capabilities in addressing the challenges of the modern world. 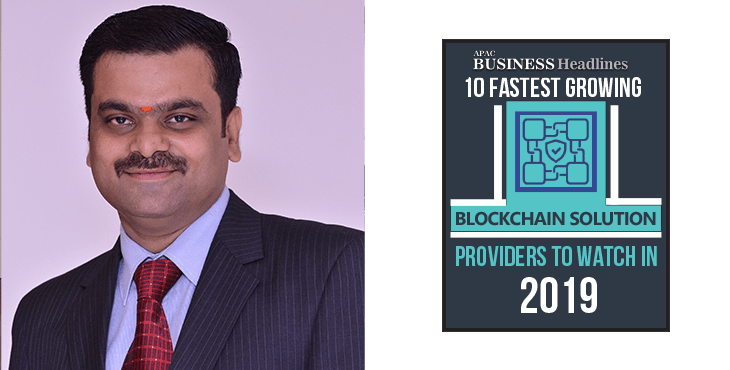 Ganapathi M affirms, “Industries such as Insurance, Banking, Supply Chain, Retail and Government Projects are well suited for enabling the Blockchain platform and launching its steady implementation”. With a team comprising of readily available, dedicated and technologically proficient people, Agira Technologies is marching towards a Blockchain-powered future. Agira’s strong commitment, diverse clientele, unique team, tailored solutions, up-to-date technology and agile practices are the main reasons why clients want to avail the company’s services.